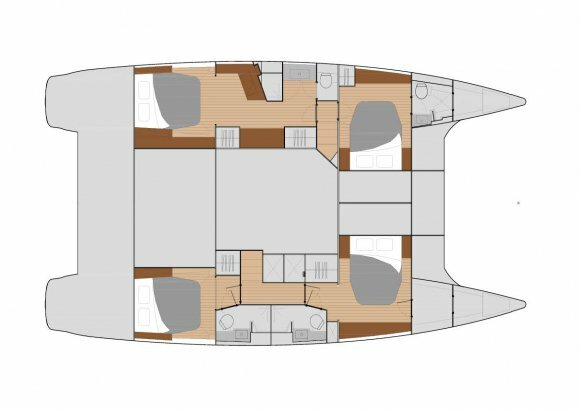 The Saba 50 continues to garner critical acclaim throughout the world for its distinctive lines, sophisticated styling, choice of spacious living areas, and outstanding offshore performance. Voted Best Boat, this sailing yacht is the perfect vessel on which to share the joy of exploring the most beautiful destinations with those you love. 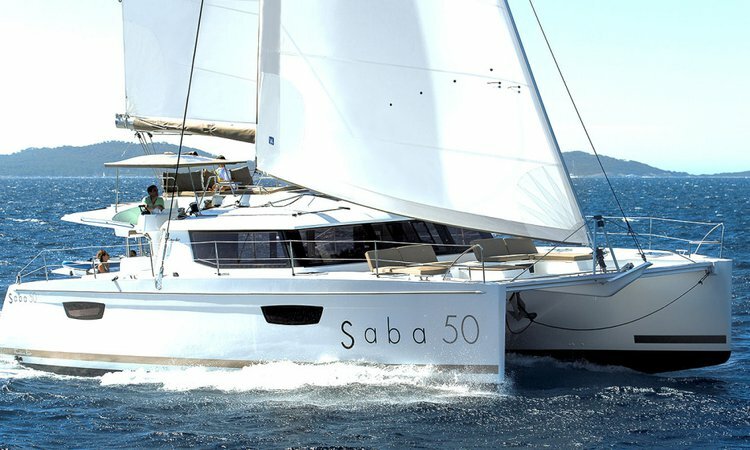 With an exterior profile that reflects the elegant and innovative philosophies of her designers, the sailing yacht Saba 50 turns heads wherever she goes. 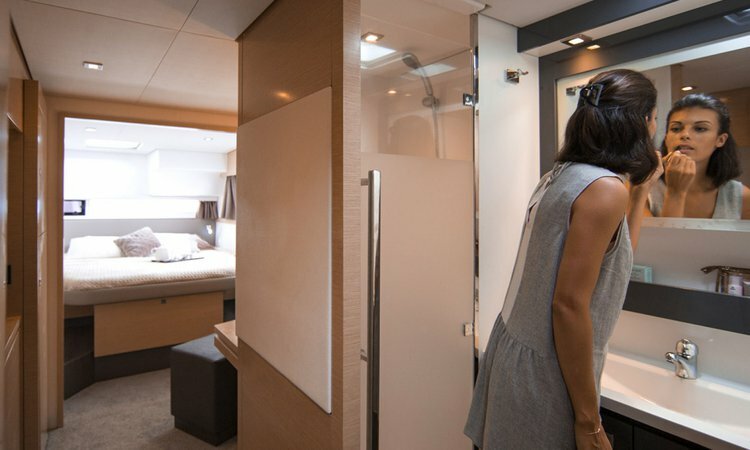 A generous lounge deck delivers a bold high-performance profile, while guests can also choose to unwind in the spacious cockpit or on the magnificent sun lounger at the fore, which provides an indulgent all-weather retreat adjacent to concealed storage lockers. 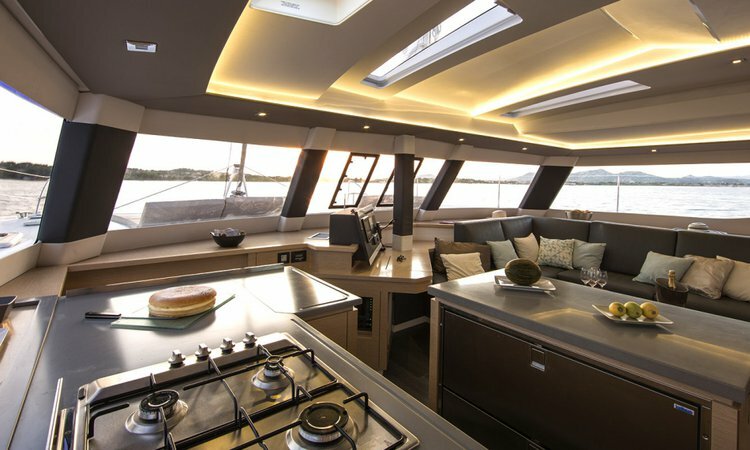 The boat’s design provides seamless movement and communication between the cockpit, helm station and lounge deck, while the incredible space in the saloon evokes the ambiance traditionally found only on much larger yachts. • $50 USD per day Damage Waiver or 11% tax added to the total. • 30 days prior: ($500 USD) $150 USD is retained, $350 USD applied towards a future charter within 24 months from the date of cancellation. 30 days or less – no refund. • Charters will not be canceled due to inclement weather or rain. However, if a named windstorm occurs, the charter fee will be prorated at 50% if refunded in cash or 100% if left on deposit towards the next charter. • We will help you on and off our docks at the start and the end of your charter. Upon your return, we will meet you at the Annapolis City Marina, where you will pump out and refuel. Our dock hand will take you and your boat back to the slip. For availability & more details please inquire directly through "Message Owner". This boat has 3 additional service(s) available. Required addons are mandatory and are already included in price. You can select opional addons to customize your trip on the next page by clicking "Book now". Usually this boat operates around Annapolis, MD. Going sailing in Annapolis, MD is an all-time favorite summer activity for locals and tourists alike. The charming capital of Maryland and home of the US Naval Academy welcomes its visitors with plenty of things to do by boat. Annapolis sailing charters are perfect for a day on the water, an overnight trip to St. Michaels, or for a romantic dinner aboard, docked or cruising along the Ego Alley. For a active trip and the chance to catch a trophy, try one of our Chesapeake bay fishing charters! Whether you are a beginner or an avid boater, Annapolis sailing is an exciting adventure you should not miss! 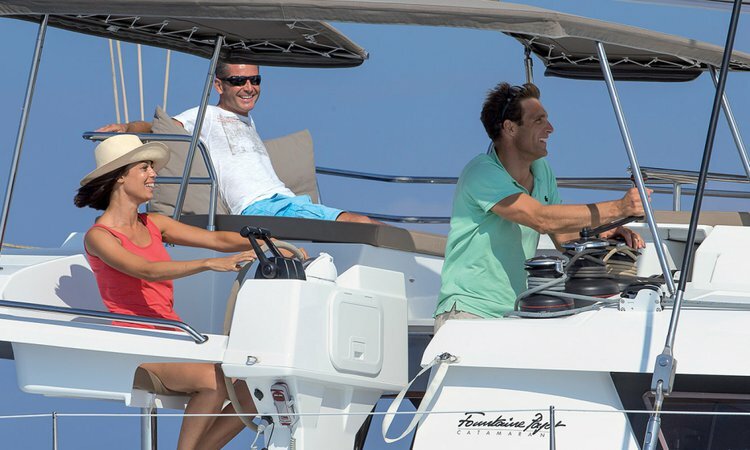 The boat rental that you have selected is a Fountaine Pajot Sail boat - an excellent choice for a day trip or a few days vacation to discover the many attractions of Chesapeake Bay. Sailing charters (captained or bareboats) are also a great idea for a weekend on the water, anytime from late March through late November. The mild climate offers a long Annapolis sailing season, with a lot of options for amazing nautical experiences, so get ready to have a lot of fun on your sailboat charter in Chesapeake Bay! 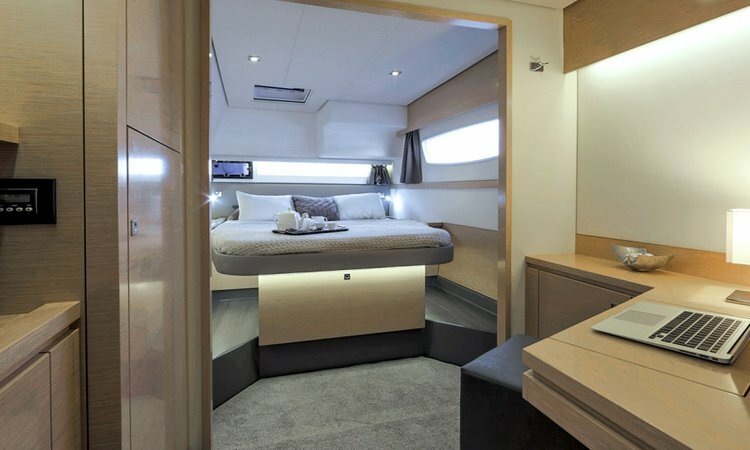 Step aboard this 49.0 Fountaine Pajot Sail boat and set sail to your next adventure. It could be a relaxed trip to admire the natural coastal beauty, a sunset cruise, or a boat ride on this Fountaine Pajot 49.0 yacht to Kent island. If you’re around for the 4th of July, do not miss your chance to enjoy the amazing fireworks aboard one of our Chesapeake Bay sailing charters! Many of our boating enthusiasts also go looking for the big trophy on one of Sailo’s Sail boat rentals in the area. For more ideas about things to do on your sailboat charter in Chesapeake Bay, make sure to check our destination guide Things to Do by Boat in Annapolis, MD. 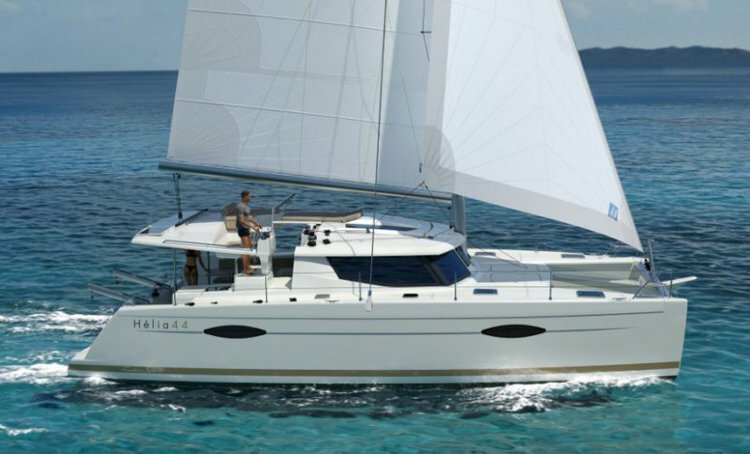 If this Fountaine Pajot Sail boat is not exactly what you were looking for, then we invite you to browse our collection of Chesapeake Bay sailing charters, with a lot of options for Annapolis sailing. Choose the dream Sail boat rental for you and your family or your friends and start planning your trip! To find out more details about this Fountaine Pajot 49.0 sailboat charter in Chesapeake Bay or to make special plans for Annapolis sailing trip , please click on the “Message Owner“ blue button to send a direct message to the boat representative. 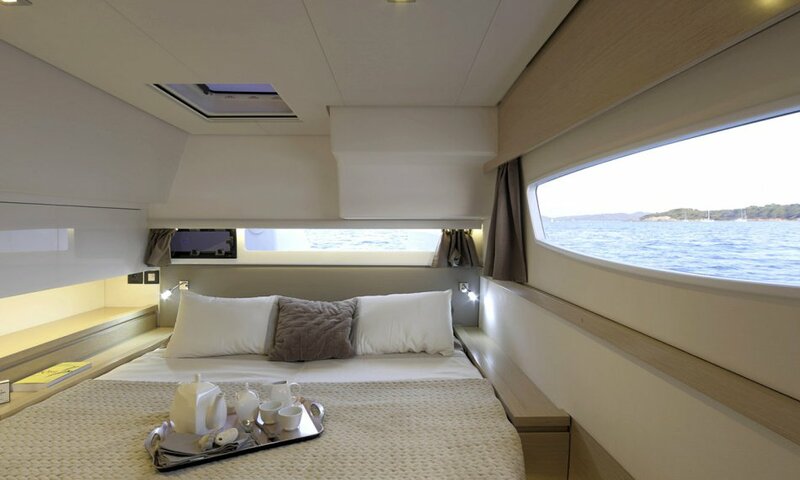 We look forward to welcoming you aboard of this amazing 49.0 Fountaine Pajot Sail boat!